We asked Libby Perry, Public Relations Coordinator of Elvis Presley Enterprises, to tell us more. How would you describe Graceland in one sentence? The home of Elvis Presley. What can you tell us about the history of Graceland? Graceland was built in 1939 as part of a 500 acre cattle farm. Elvis purchased the home and 13.8 acres in 1957 with the earnings from his first film “Loving You” for just $102,500. It was named Graceland after the owner, Mrs. Moore's aunt, Grace Toof, the original landowner. Elvis loved the name Graceland so much he decided to keep it. What do guests see on a visit to Graceland? Why is Elvis Presley such an endearing and beloved music icon? Elvis’ story is truly that of the American dream. He was born in a two room house to a working family, raised on government food, drafted in the army, and told to be an electrician. So many people in America and around the world face the same struggles he did, which make his life - and legacy - that much more endearing. 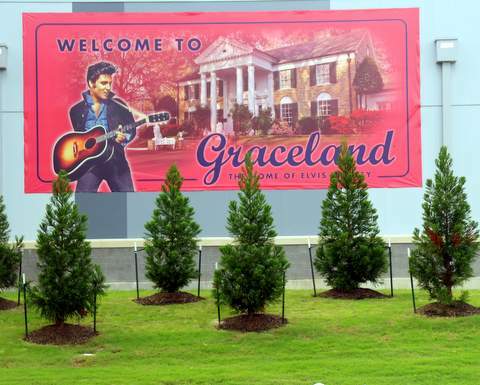 Why is Graceland such a popular destination? Elvis changed the face of music and society forever and there’s no better place to experience that than his timeless home, Graceland. Graceland's Ticket Office is located at 3765 Elvis Presley Blvd, Memphis, Tennessee 38116. You may book a stay at Graceland’s new world-class resort: GuestHouseGraceland.com.